First of all, what is a pipe flange? Well, a pipe flange is a cast or forged steel ring that is specifically designed to connect or join certain sections of a pipe to various pieces of equipment such as valves, pressure vessels, pumps and much more. They are usually threaded or welded, and are designed to provide a tight seal by bolting two flanges together with gaskets. Another benefit is that it enables easy access to a pipework system in the event of an inspection, any required modifications or scheduled cleaning. With that being said, here are some of the main types of pipe flanges in the UK that you can find. This type of pipe flange is ‘slipped’ over the pipe as its diameter is slightly larger than the pipe itself, creating a tight fit around the pipe. The base side and top of the pipe flange is then welded to provide a strong connection and a tight seal. 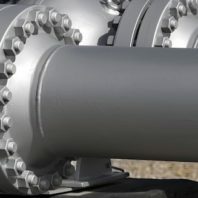 These types of pipe flanges are considered to be cost-effective yet still known to provide a strong and durable connection. A similar concept as the slip-on flange, except it has an inner diameter, or bore, that has been counter-bored so that it will accept pipe. This type of pipe flange is typically used with high-pressure pipework systems that are smaller-sized. The diameter of the flange’s bore is the same size as the pipes inner diameter so it can be easily attached to the pipe by fillet welding the hub around the flange. A blind flange is a pipe flange that does not have a bore. It is typically used to seal or fix the end of the framework piping or to shut off the opening of a vessel or piping system. A blind flange enables quicker and easier inspection of the piping system or vessels by allowing easier access to the system interior. A threaded flange is similar to a slip-on flange as it can be slid over the pipe, but does not require any welding during the assembly as the inner diameter is threaded, resulting in an ideal pipe flange for low pressure piping systems. This is also because in smaller pipework systems where welding could be dangerous, a pipe flange that requires no welding that can still create a tight seal is highly beneficial and safer. This flange is attached by the neck of the flange being welded to the pipe and is ideal for high stress applications. This is because the neck greatly reinforces the flange. The flanges bore is also made to match the pipe’s bore to reduce any erosion or turbulence. Of course, the type of pipe flange you choose to work with depends on what type of work you are conducting. When looking for pipe flanges in the UK, be sure to look for a company that has not only a long history of experience working with pipework systems, but also has a high-capacity warehouse to ensure that they will have the exact pipe flange you are looking for.